From parts of Albany and all over south Georgia on Monday, came stories of the storms fury from over the weekend. 11Alive's Ryan Kruger spoke with people in Albany who rode out the storm. When they opened the doors, all they saw was destruction. "I thank God for sparing my life," said Delinda Wright. "God still got me." Wright is counting her blessings. When the storm rolled through Sunday afternoon, she grabbed her puppy and hunkered down in her bathroom. "I could hear them falling over and pushing onto the house," she said. The storm covered a large area. For several blocks all you can see is trees that have fallen and homes that are destroyed. At one house, the roof and walls were blown off he second floor, yet this furniture remains unmoved. Dolores Dunlap was with her kids and grandkids. "We were in the closet, I was just praying," she said. The deadly tornado came just 20 days after another devastating storm hit the northwest part of town. Roosevelt Smith says his neighbors are still picking up from that storm, and now he has to help loved ones who lost their home in this recent storm. "This town has come together," he said. "We have embraced each other. I would just like for people to be praying for Albany." County officials on Monday urged President Donald Trump to cut through the red tape and get boots on the ground in Albany and south Georgia as soon as possible. Video images from a drone show an Albany neighborhood left in ruins with trees toppled. At least 15 people were killed and 43 hurt across the state of Georgia over the weekend due to the storms. Albany and Dougherty County were pummeled by a storm that lashed the area with winds of more than 70 mph. Gov. Nathan Deal expanded a state of emergency for 16 southwest Georgia counties Monday morning due to the storms -- Atkinson, Baker, Berrien, Brooks, Calhoun, Clay, Colquitt, Cook, Crisp, Dougherty, Lowndes, Mitchell, Thomas, Turner, Wilcox and Worth. National Weather Service survey teams were in south Georgia beginning early Monday, and by midday, teams indicated they had confirmed tornado damage in portions of Wilcox, Houston, Wilkinson and Washington counties. Specific information on the intensity of the storms that struck those counties will be available Monday evening or on Tuesday. Surveyors were able to determine that damage from the tornado that hit Dougherty County was of at least EF-2 intensity. A damage path of at least a mile wide was found in some areas of the county. The survey area for the second half of the tornado's path through portions of Worth and Turner counties will be conducted on Tuesday. The survey for the tornado that struck Thomas, Brooks, Cook and Berrien counties was still ongoing late Monday afternoon. A survey of the storm that hit Henry, Clay, Calhoun, Randolph and Early counties will be conducted on Tuesday also. A search is ongoing for a missing toddler in southern Georgia after deadly tornadoes struck the South, claiming at least 20 lives in a terrifying weekend for the region. The child's mother told Dougherty County officials the child was swept away by the tornado that struck near Albany Sunday evening, WALB reports. Law enforcement officials in Albany said it could be days before they are able to ensure there are no more victims. The enormous storm system that crossed the South over the weekend kicked up more than two dozen tornadoes, shredded homes and left other destruction scattered around the Southeast has claimed at least 20 lives after a two-day assault on the region. Georgia's latest deaths were confirmed Monday morning by Dougherty County Coroner Michael Fowler, who said a total of four people died in the county Sunday after the tornado hit Albany. Emergency officials in Columbia County, Florida, reported one person was killed when a large tree split a home in half in the Lake City area. The day's deadliest toll came before daybreak Sunday when an apparent tornado blew through a mobile home park in south Georgia — about 60 miles southeast of Albany — shearing away siding, upending homes and killing seven people. Cook County Coroner Tim Purvis confirmed that seven people died at Sunshine Acres, where roughly half of the 40 homes were "leveled." President Donald Trump said Sunday he had spoken with Georgia Gov. Nathan Deal and "expressed our sincere condolences for the lives taken." "Tornadoes were vicious and powerful and strong, and they suffered greatly," Trump said during a White House ceremony where he was swearing in aides. "So we'll be helping out the state of Georgia." Officials in Albany, a city of roughly 77,000 described the damage looking as if a nuclear bomb had gone off. "It is just total devastation and destruction," Dougherty County EMA director Ron Rowe said in a press conference. "We have several neighborhoods that have just been removed." In addition to the deaths in Albany and Adel, two people were killed in the same home in Barney, which was blown onto Highway 122, according to WALB.com. Officials identified them as Jessie James Newsome and Bettie Lee Newsome. In Berrien County, the sheriff's office confirmed to the National Weather Service that two people died near New Lois, likely in a continuation of the reported tornado that hit Adel. Russell Nix, 82, and his wife Ann Nix, 78, died when an oak tree fell on their home on Old Lois Road, WALB also reported. The National Weather service estimates that at least 12 tornadoes hit the state over the weekend. Dozens of injuries have been reported across the region, and others were lucky to survive, emerging relatively unscathed from heavily damaged homes. "The hall wall came in on me and I fell down. And our backdoor came through and fell in on me," Cook County resident Jenny Bullard, 19, told WALB. "And I heard my dad calling my name ...There was a bunch of stuff on top of him and I just started throwing everything I could until I got to him." A Wal-Mart in the city of Warner Robins was heavily damaged Saturday. The Macon Telegraph reported that Houston County EMA Director Jimmy Williams confirmed significant damage to the store, with water in the aisles and a gas leak. Roof damage from heavy winds was reported in Howard, and several structures reported major damage in Washington County. More than 17,000 remained without power across the state as of Sunday evening, WSBTV.com reports. Monday morning Gov. Nathan Deal added nine south Georgia counties to his emergency declaration, in addition to the seven counties first declared over the weekend. 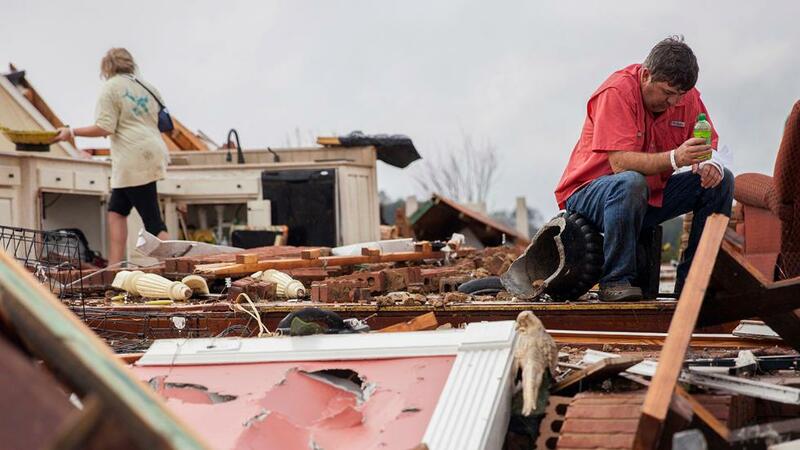 Hattiesburg saw the most extensive damage on Saturday. Four people lost their lives after an EF3 tornado hit the region. Forrest County Coroner Butch Benedict identified the victims: Earnest Perkins, 58; Cleveland Madison, 20; David Wayne McCoy, 47 and Simona Cox, 72. Many survivors, like Darryl McMorris, told stories of the tornado's horrifying path of destruction. He told the Associated Press that he held onto his daughters as the twister destroyed their house, wall by wall – one of which fell on top of them. They all survived, but their house is a total loss, the report added. "Is God mad at us?" his daughter asked. At least 50 people were treated for injuries at area hospitals, Mississippi Emergency Management Agency spokesman Greg Flynn told the AP. Insured damages are likely to top $200 million in Hattiesburg alone, Insurance Commissioner Mike Chaney said. "You've got so many buildings that are for all practical purposes totally destroyed," Andy Case, a disaster recovery specialist with the Department of Insurance, told the AP. At William Carey University, dorms were damaged and several injuries reported on their campus. According to WDAM.com, WCU women's soccer player Taylor Gautreaux lost three fingers when a door was slammed shut on her hand. Gautreaux's coach, Danny Owens, told WDAM she's recovering in a hospital. "Campus is closed until further notice," the school's official Twitter account said. "Students are being escorted from campus. Arrangements will be made for students who cannot go home." Florida received numerous reports of damaging wind gusts in the Panhandle and across the peninsula. Some of the wind damage reports could eventually be confirmed as tornado damage after National Weather Service surveys are completed. One person was injured near Lake City after a tree fell and split a home in half. Several trees and power lines were downed in Panama City, and a 68 mph wind gust was clocked at nearby Tyndall Air Force Base. In central Florida, mobile homes suffered roof damage near Lakeland and Bradenton. William T. Dwyer High School in Palm Beach County was closed Monday due to possible tornado damage. The National Weather Service confirmed two tornadoes struck South Carolina over the weekend, injuring one woman. The weather service says an EF2 tornado touched down about 3:45 p.m. Saturday in Barnwell County and moved into Bamberg County. The woman was trapped in a mobile home that was damaged near Blackville. She was taken to a hospital but there was no word on her injuries. Hundreds of trees were blown down and several homes and barns were damaged. Ar least four tornadoes hit the state over the weekend, including an EF2 that completely destroyed four homes and damaged 20 other buildings in Choctaw County. Trees and utility poles were downed and there was various structural damage in the Pepperell Village area in Opelika, where a tornado touched down Sunday. The same storm tore the roof off of a mobile home in Chewacla State Park in Lee County Sunday, according to NWS. Louisiana saw five confirmed tornadoes over the weekend, including an EF2 tornado that struck near Plain Dealing Saturday, the National Weather Service reports. The Bossier Parish Sheriff's Office said that two dozen homes were damaged; two mobile homes were rolled and completely destroyed. There were no injuries reported. 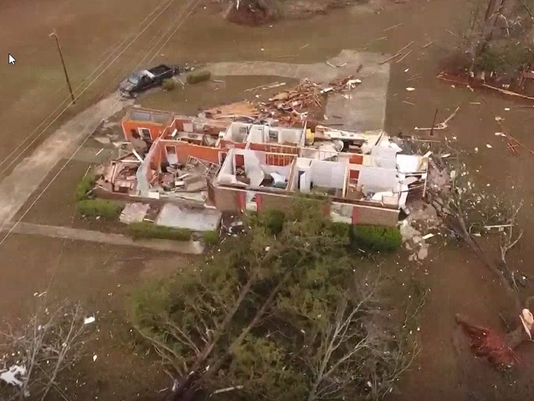 Ten to 15 homes were damaged or destroyed in Natchitoches Parish by reported tornadoes and storms, the Natchitoches Parish Sheriff's Office said. A few injuries were also associated with the storms, but none were considered life-threatening. North of Colfax in Grant Parish an EF1 flipped a mobile home, injuring a woman inside and dropped a tree on another home causing major damage. According to the Sheriff's Department, a man in Point Place, Louisiana, "was sucked out of his brick home through the front door and thrown in his front yard." Reported tornadoes damaged at least eight homes in Scottsville, Texas, late Saturday afternoon. KTAL reports that the entire area is without power as crews work to clear downed power lines and trees. Luckily, no one was injured. Saturday wet roads contributed to the deaths of two men in Harris County, Click2Houston.com reports. Three men were in the car driving on Gears Road at 11 p.m. when the incident occurred. The driver lost control of the vehicle, causing them to crash through a fence and into a tree on the north side of the roadway. The two victims were identified as David King and Joshua Vinson. The third passenger was transported to Memoria Hermann hospital. ADEL, Ga. - Emergency responders rushed to answer new reports of deaths and injuries Sunday evening in southern Georgia as violent storms already blamed for killing 18 people in the Southeast continued to inflict destruction. An apparent tornado blew through a mobile home park early Sunday in southern Georgia's rural Cook County, sheering off siding, upending homes and killing seven people, local authorities said. An eighth death was reported in Cook County by state officials, although it was unclear whether that victim lived in the park. Another tornado later in the day in Albany resulted in another three deaths. Two people apiece were confirmed dead in neighboring Georgia counties, bringing the state's toll to 14 a day after a reported tornado killed four in Mississippi early Saturday. Gov. Nathan Deal has declared a state of emergency for seven south-central Georgia counties -- Atkinson, Berrien, Brooks, Colquitt, Cook, Lowndes and Thomas. "It’s destroyed," Vanessa Jones said of her Albany neighborhood. "It looks like a war zone. All of the trees are snapped in half; trees on top of people's houses: power lines down. There is no way to get on that road or off that road without walking. Cars cannot go up and down. Power lines are everywhere." The National Weather Service in Jacksonville said the storm "has the potential to be one of the most severe weather outbreaks since the 1993 super storm and possibly like the big tornado outbreak near the University of Alabama a few years ago." These storms have devastated communities and homes in South Central Georgia, and the state is making all resources available to the impacted areas. These storms have resulted in loss of life, numerous injuries and extensive property damage, and our thoughts and prayers are with Georgians suffering from the storm’s impact. As we continue to assess the damage, I’m prepared to expand or extend this emergency declaration as needed. In addition to the state’s response, all indications suggest we will also be submitting a request for federal assistance as well. WALB-TV in Albany, Georgia, reported that people were trapped under rubble caused by the storm. Catherine Howden of the Georgia Emergency Management Agency said Sunday morning that the deaths occurred in Cook, Brooks and Berrien counties. In southern Georgia, two people were killed early Sunday by a possible tornado, officials from the Brooks County Sheriff’s Office confirmed. The two people who were killed were in a home together along Highway 122. She said the deaths were related to severe weather but could not specify whether tornadoes were the cause. Tornado warnings had been issued for parts of Georgia overnight. Tornado warnings extended east into southeast Georgia through the morning and afternoon, with a possible sighted in Camden County about 6:30 p.m. No significant damage was reported and the wall of storms that spawned all the bad weather moved offshore by 7:15. Many homes and businesses were destroyed as the storm tore through southern Georgia. In Adel, the Bullard family was hit hard as two of the family's homes were turned to rubble. "My granddaddy called my daddy about 4 o’clock, saying that my uncle’s house had gotten hit by a tornado," Jill Bullard said. "We all got up and come down here. Our farm’s destroyed right up there across the road. My uncle’s house is in half, it’s gone, he’s in the hospital right now but luckily we’re all safe and okay for the most part." Bullard's said her uncle was in his house when a tornado ripped through it. “He was actually sitting in the living room and he was asleep and he heard, (what) he thought it was a hurricane," Jacklyn Bullard said. "He went into his wife’s room and told her. Next thing you know, he was going to check in on his daughter, she was across the house, as he’s coming through, that’s when it (the tornado) came through his house and he got thrown out there in the ditch." Jacklyn Bullard said her uncle and his daughter are in the hospital and expected to be OK. Her uncle's wife was uninjured. It was a frightening moment for people in Folkston when they found out they were under a tornado watch. "Oh man, I got woken up to my phone going off, telling me there was an alert," Mathew Abels said. "So I got up (and) looked. (I've) never seen it like this before." Ware County emergency management reported no major damage, but flooded roadways could be a problem for drivers. No trees down, or issues, but emergency management says the major roads people travel through there are covered with rainwater. Ware County schools have canceled classes Monday due to impassable road conditions. Students and staff will both have the day off. District officials will meet with county road officials, the sheriff's official and Waycross police on Monday afternoon to determine when schools will reopen. Brantley and Pierce county schools also canceled classes for Monday due to weather conditions. Students and staff will have the day off. Two shelters have been established in Cook County -- Adel First Assembly of God at 1601 Massee Post Road and at the First Baptist Church of Adel at 200 East 5th Street. Families in Adel, Georgia, seeking information about missing individuals are urged to contact the Adel First Assembly of God at 229-896-3935 or 229-561-2875 or call the First Baptist Church of Adel at 229-561-1201. A shelter opened in Valdosta, Georgia at the James H. Rainwater Conference Center at 1 Meeting Place. They can be reached a 229-245-0513. 0 Response to "Albany storm damage visible from the air"